Venture Corporation - DBS Research 2017-08-08: Record Quarterly Performance. Venture Corporation - Record Quarterly Performance. Venture Corp's 2Q17 revenue grew 48% y-o-y with net profit surging 61%, well above expectations. Strong growth momentum continues; 15th consecutive quarter of revenue growth (y-o-y basis). Cash conversion cycle improvement yet another positive. Maintain BUY, TP raised to S$16.60 on higher forecast earnings, and shift in valuation base to FY18F. Venture has demonstrated consistent revenue growth (on a y-o-y basis) for the last 15 quarters. With earnings growth trajectory gaining momentum over the last five quarters, we believe that Venture's efforts to grow in new niche segments has come to fruition. Market leaders in attractive end markets that Venture has exposure to, such as genome sequencing and optics, have also posted double digit revenue growth guidance for the year. Venture’s fixed dividend commitment of 50 Scts (~3% yield) coupled with > 30% earnings growth prospects for FY17F are attractive attributes, and we retain our BUY call. 2Q17 results well above expectations. 2Q17 results saw continued strong growth momentum from 1Q17 (we recall that 1Q17 results posted revenue and net profit growth of 33.7% and 35.5% y-o-y respectively). 2Q17 revenue grew 48.3% y-o-y with net profit surging 60.9%. This is the 15th consecutive quarter of revenue growth (on a y-o-y basis). The strong set of results is a function of broad-based revenue improvement from a majority of Venture’s customers. According to the management, this has been aided by both new products launched in previous quarters which were well-received by end customers, as well as new products launched in the current quarter. Margin expansion alongside strong revenue growth. After adjusting for one-off items, net margin stood at 7.2% for the quarter, compared against 6.3% in 2Q16. We believe that the Test, Measurement, Medical and Life Science segments contributed to the strong margins as these segments typically enjoy superior margins due to the complexity and niche industry know-how required. Cash conversion cycle improvement is yet another positive. Venture’s cash conversion cycle was 80 days for the quarter, a marked improvement from 93 days in 1Q17. Management has been working on improving working capital, and inventory level has been held constant since the increase observed in 1Q17 and the company will only hold more inventories on behalf of customers on customers’ request. Venture charges a fee for holding inventories on customers’ request. Associate Fischer Tech received takeover offer. As of 31 Dec 2016, Venture owns 18.8% of Fischer Tech Ltd, which has received a takeover offer valuing the company at S$168.45m (S$3.02/share). 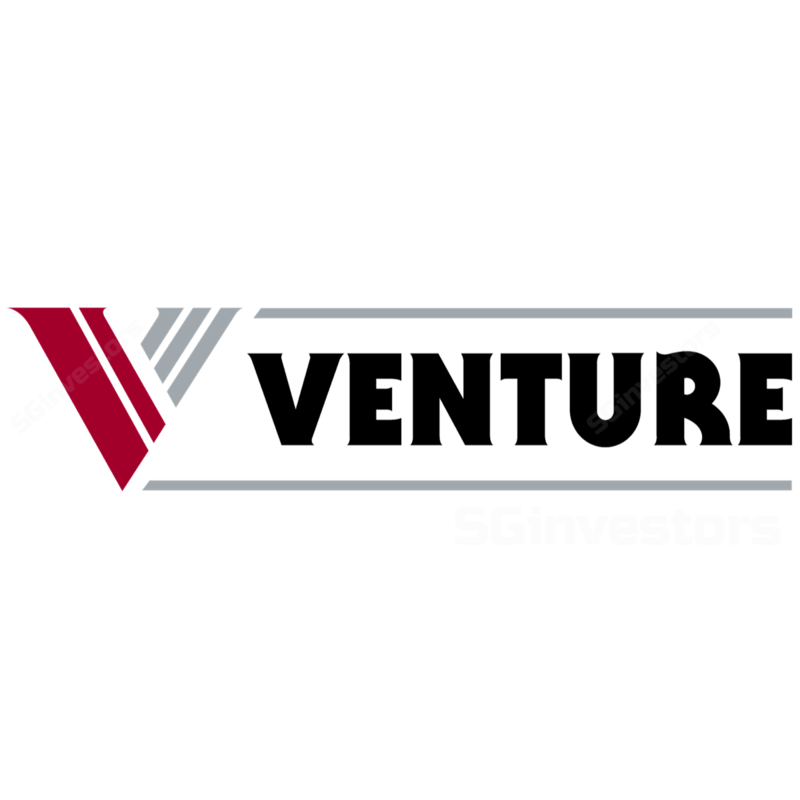 Venture’s carrying amount for Fischer Tech as of 31 Dec 2016 is S$19m (S$0.07/share). If the deal goes through, we expect Venture to book a gain of S$12.7m (c. S$0.05/share), which we have yet to input in our numbers. Differentiated offerings from competitors, maintain BUY with revised TP of S$16.60. We believe that Venture has successfully differentiated its offerings from its competitors in the Electronics Manufacturing Services space by consistently working with its clients and creating value for its clients along the supply chain, starting from design, as demonstrated by its superior margins. We maintain BUY, TP raised to S$16.60 pegged to its historical 5-year mean PE of 18.2x, and as we roll forward our valuation base to FY18F and adjusted earnings by +15%/+11% for FY17F/18F based on its strong performance in the last 2 quarters. This is supported by ~19x average of forward PE for high mix low volume EMS peers. We remain positive on Venture’s growth trajectory and believe the market has yet to fully price in Venture’s growth potential given its unique offerings, superior technology knowhow and hard to replicate ecosystems. Weakening global growth prospects. A broad global slowdown is likely to impact Venture due to its vulnerability to business cycles.